A gentle but thorough introduction to the world of computer programming, it's written in language a 12-year-old can follow, but anyone who wants to learn how to program a computer can use it. Even adults. Written by Warren Sande and his son, Carter, and reviewed by professional educators, this book is kid-tested and parent-approved. Learn to talk to your computer in its own language! Whether you want to create a game, start a business, or solve an important problem, the first step is learning to write your own programs. Programming is a fun challenge, and it's easy to get started! 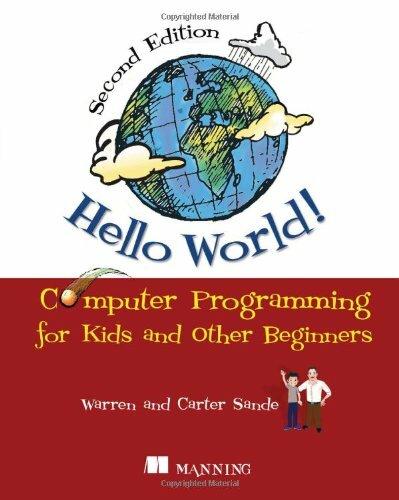 This updated and revised edition of Hello World! introduces the world of computer programming in a clear and engaging style. Written by Warren Sande and his son, Carter, it is full of examples that will get you thinking and learning. Reviewed by professional educators, this book is kid-tested and parent-approved. You don't need to know anything about programming to use the book, just the basics of using a computer. If you can start a program and save a file, you'll be off and running! Hello World! uses Python, a programming language designed to be easy to learn. Using fun examples, it brings to life concepts of computing— looping, decisions, input and output, data structures, graphics—and many more. Warren Sande is an electronic systems engineer who uses Python both as a "do anything" scripting language and as a way to teach computers and programming. Carter Sande is a high school student who is passionate about technology. When he's not fixing his school's network and helping his classmates recover lost homework, he likes to ride his bike and write retro video games.